USING THIS DIESEL LOCOMOTIVE 3TE10U ON ANY OTHER SITES WITHOUT PERMISSION OF AUTHORS AND ADMINISTRATORS IS PROHIBITED! ATTENTION! FOR CORRECT USING OF THIS LOCOMOTIVE YOU NEED TO DOWNLOAD CABVIEW_5 VER. 1.1 OR NEWEST FOR 2TE10U AND SOUNDS FOR TE10! IT'S NECESSERY USING 2TE10U AND 3TE10U LOCOMOTIVES! The model painted like its prototype 2TE10Utk-0009 ( A ) at May 2005, when it works at Pechora depot of Northern railroad. 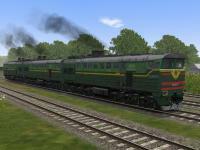 USING THIS DIESEL LOCOMOTIVE 2TE10Utk ON ANY OTHER SITES WITHOUT PERMISSION OF AUTHORS AND ADMINISTRATORS IS PROHIBITED! ATTENTION! FOR CORRECT USING OF THIS LOCOMOTIVE YOU NEED TO DOWNLOAD CABVIEW_1 FOR 2TE10Ut AND SOUNDS FOR TE10! 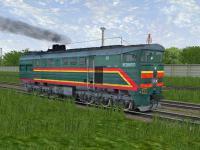 USING THIS DIESEL LOCOMOTIVE 2TE10U ON ANY OTHER SITES WITHOUT PERMISSION OF AUTHORS AND ADMINISTRATORS IS PROHIBITED! ATTENTION! FOR CORRECT USING OF THIS LOCOMOTIVE YOU NEED TO DOWNLOAD CABVIEW_5 FOR 2TE10U AND SOUNDS FOR TE10! IT'S NECESSERY USING 2TE10U LOCOMOTIVES! ATTENTION! FOR CORRECT USING OF THIS LOCOMOTIVE YOU NEED TO DOWNLOAD CABVIEW_4 FOR 2TE10U AND SOUNDS FOR TE10! The model painted like its prototype 2TE10Ut-0079 at August 2005, when it works at Pechora depot of Northern railroad. USING THIS DIESEL LOCOMOTIVE 2TE10Ut ON ANY OTHER SITES WITHOUT PERMISSION OF AUTHORS AND ADMINISTRATORS IS PROHIBITED! ATTENTION! FOR CORRECT USING OF THIS LOCOMOTIVE YOU NEED TO DOWNLOAD CABVIEW_3 FOR 2TE10Ut AND SOUNDS FOR TE10! IT'S NECESSERY USING 2TE10Ut & 2TE10Utk LOCOMOTIVES! The model painted like its prototype 2TE10Ut-0078 at March 2010, when it works at Chelyabinsk depot of South Ural railroad. The model painted like its prototype 2TE10Utk-0005 at March 2007, when it works at Solvychegodsk depot of Northern railroad.